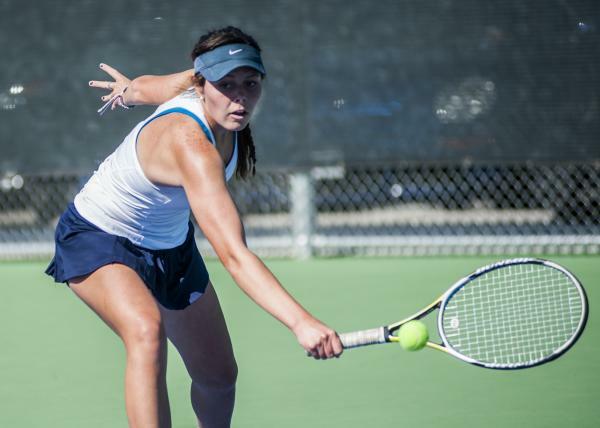 Centennial's McKay Novak reaches for a backhand on her way to winning the Division I girls singles title. Centennial's McKay Novak prepares to hit a backhand on Saturday. 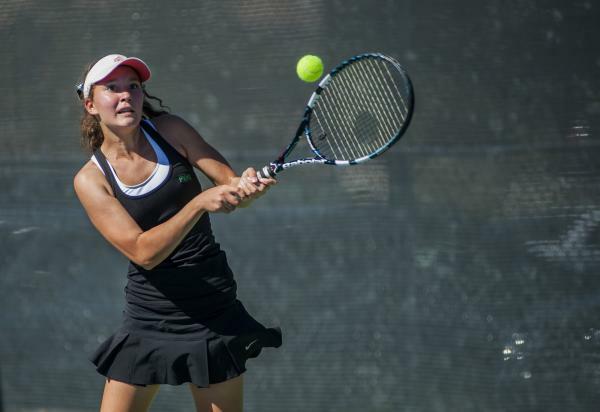 Palo Verde's Annie Walker hits a forehand in the girls singles championship match. 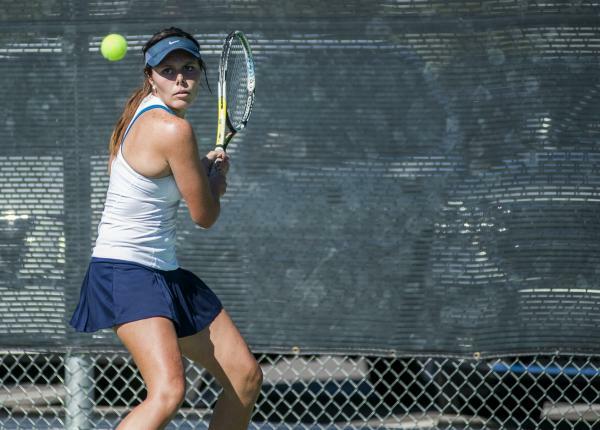 Palo Verde's Annie Walker hits a return in the girls singles title match. 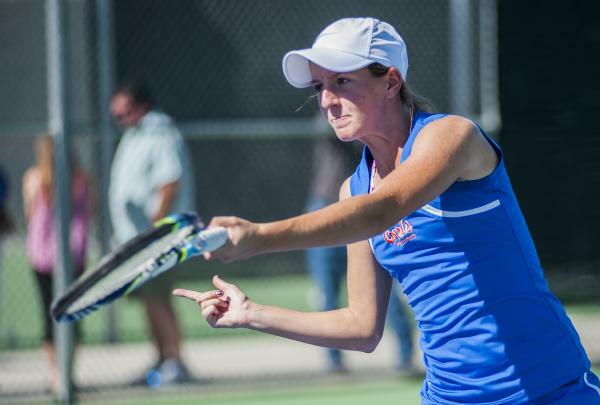 Bishop Gorman's Julia MacDonald concentrates on a shot in the girls doubles final. 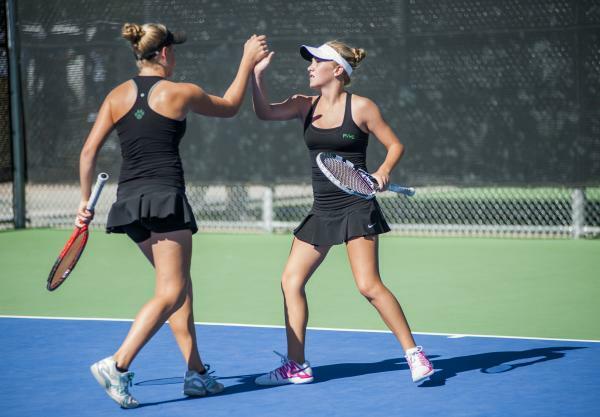 Palo Verde's Chloe Henderson, left, and Sophie Henderson celebrate in the girls doubles final. Palo Verde's Chloe Henderson, right, hits a backhand as Sophie Henderson waits near the net. 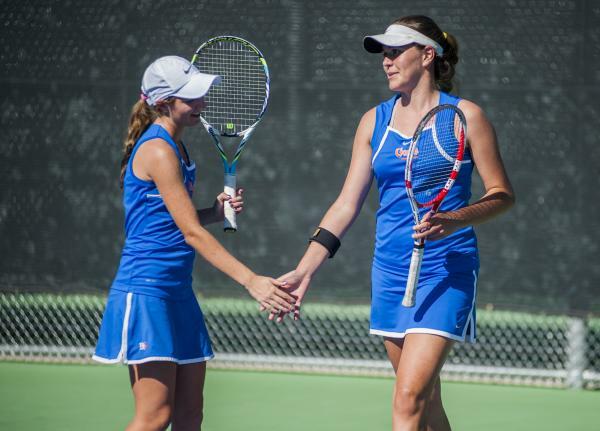 Bishop Gorman's Julia MacDonald, left, and Zoe Lier, congratulate each other after winning a point. 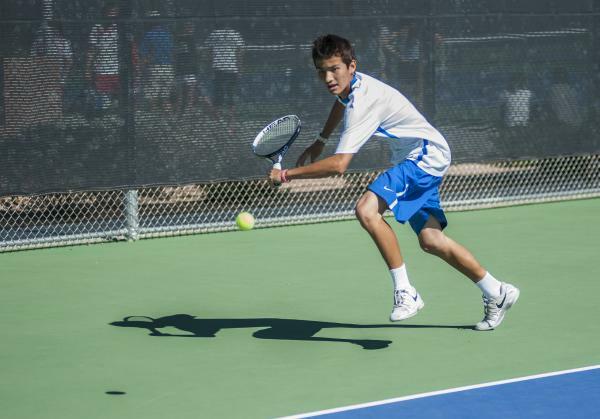 Bishop Gorman's Dylan Levitt, reaches for a backhand in the boys singles final. Bishop Gorman's Dylan Levitt prepares to hit a return in the boys singles final. Coronado's Cassell King keeps his eye on the ball in the boys singles final. Six grueling sets of tennis in the sun Saturday took their toll on McKay Novak. Her mixed bag of shots took their toll on anyone who tried to keep the Centennial senior from a state title. Playing her second three-set match of the day, Novak outlasted Palo Verde freshman Annie Walker 6-2, 1-6, 6-4 in the Division I girls singles final at Bishop Gorman. 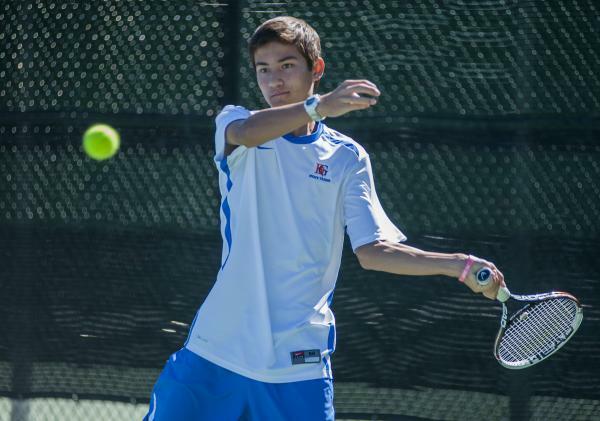 Novak, who took third in the Sunset Region tournament last week, needed nearly 2½ hours to oust defending state champion Chelsea Crovetti of Gorman 3-6, 6-4, 6-4 in a semifinal and then had only about a 90-minute break before being back on court. She rode the momentum of the semifinal win through the first set of the title match and then ran into trouble in the second set before building a 5-2 lead in the third set. Walker held serve and then broke Novak to make it 5-4. Novak then broke back, converting her third championship point into the win. 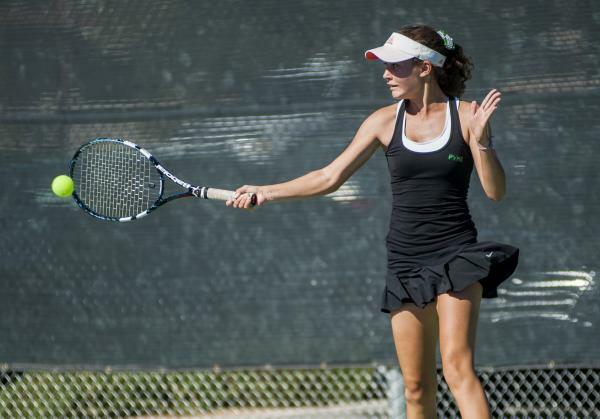 Novak, who also won a team title with The Meadows in 2010, became the first Centennial girl to win a state singles title. Gorman freshman Dylan Levitt was more economical, downing Coronado senior Cassell King 6-3, 6-2 in the boys singles final. 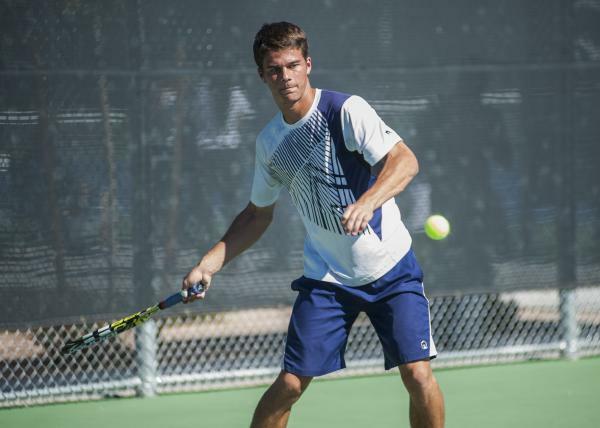 Levitt led only 3-2 in the opening set before taking nine of the next 12 games to finish the match, capping a season that saw him win the Sunset Region singles title and help the Gaels to the state semifinals in team competition for the first time in 10 years. 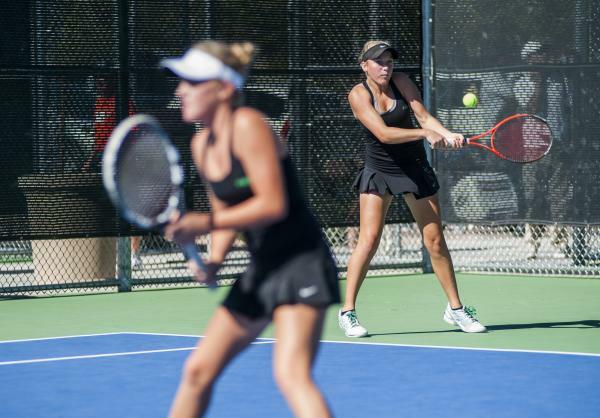 Sibling combinations claimed both doubles titles with Coronado sophomore twins Jack and Jamie Vance earning the boys doubles title and Palo Verde sisters Chloe Henderson and Sophie Henderson winning the girls doubles crown. The Vance brothers, who helped Coronado to the state team title Friday, topped Reno’s Dominic Aramini and Kai Mars 6-2, 6-3. The Vances were the first off the court Saturday, shortening points by being aggressive and forcing the Reno team into mistakes. After letting a chance to end the match in the eighth game of the second set slip away, the duo rallied from love-30 in the final game to win. The Henderson sisters rolled to a 6-3, 6-2 win over Gorman senior Julia MacDonald and freshman Zoe Lier. “It’s nice to win with my sister,” said Sophie Henderson, a freshman. Chloe, a sophomore, won the state doubles title last season with partner Kristen Newell. The Hendersons couldn’t have done much better, effectively keeping the ball away from the 6-foot Lier when the Gorman player was at the net. “We were trying to keep it away from her and play smart,” Chloe Henderson said.